3,453 days since the S&P 500 hit its low of 666 on March 9, 2009. Since then, the broadest US blue-chip index has more than quadrupled in price terms…. What’s interesting to me, though, is this graph that was presented early in the piece. Notice the gray line, which represents the Shanghai Composite Index. 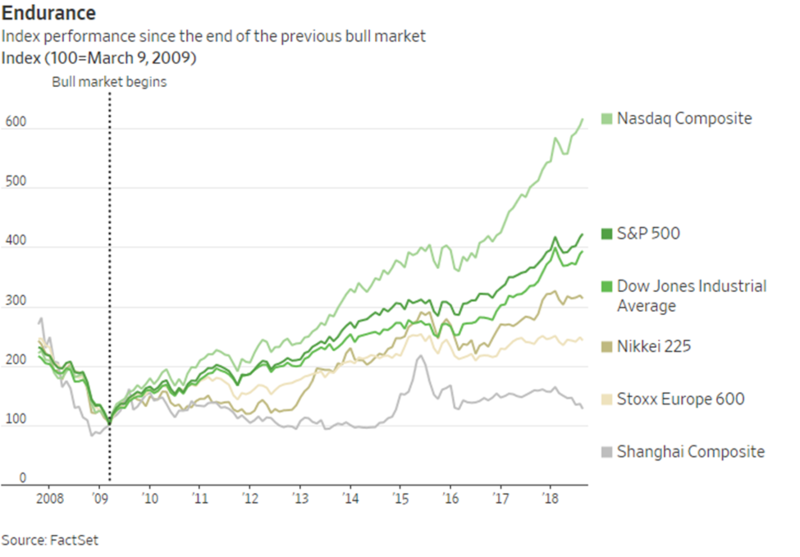 The People’s Republic of China’s index representing the PRC’s stock market, such as it is, bottomed out some months earlier than did our market and those of Europe (Stoxx) and Japan (Nikkei)—and since then it has never really recovered, rising only slightly since that bottom. It would seem (preaching to the choir, perhaps) that government manipulation of an economy doesn’t work very well—not even when it’s done by the smartest folks in the PRC room. This entry was posted in Economics, political economy, politics and tagged economics, political economy, politics by eehines. Bookmark the permalink.